In the summer of 1979, I finished the 7th grade with $180 in my savings account. I knew exactly what I wanted – a new Schwinn Le Tour IV ten-speed bike. At 13.6 kg, it was “way lighter” than my brother’s tank of a bike – the ubiquitous Varsity. As with most kids and their bikes, it meant total freedom since I could now go anywhere I wanted without having to ask for a ride. But then I saw the movie Breaking Away, and bike riding became cycling. The next day, I upgraded my bike with a pair of toe clips. Now I could race the bus to school and win, and make the three mile climb up Chantry Flats without stopping. I rode that bike everywhere – even into my college years. Without turning this into a memoir, let’s fast forward 35 years. I’m yearning for the good old days and want another road bike. After a bit of research, I settle on a Cannondale SuperSix Evo. I really like the bike. It’s light. It handles well, and the carbon frame with modern components make it really fun to ride. My only grievance is that it uses external cable routing. I don’t know why this bugs me so much. Some people say it’s much easier to maintain, but if that is true, the fact is during the other 364 days per year, it just looks retro. So then I start to research pro bikes like the Venge, and Madone – beautiful bikes with completely hidden cabling – but a $10K+ price tag. Then while riding my first club century, I team up with a guy riding this beautiful carbon frame with internal cabling and no decals. I ask him what kind of bike it is, and I am exposed to the world of open-mold frames. I decide that some day, I am going to build a new bike exactly the way I want it using open-mold parts. 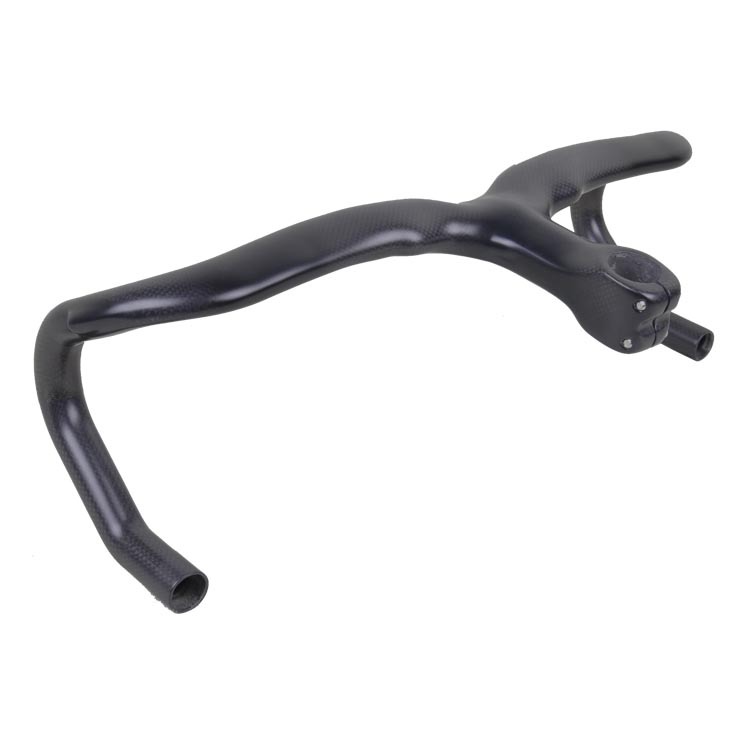 If you are new to the open-mold concept, they are the carbon parts of your bike, made by companies mostly in China and Taiwan. The idea is that these are the companies that make frames, forks, wheels, saddles, and handlebars for the name brand companies, but have created their own unique designs and sell them for considerably less than for what the big bike companies sell them. So now I just need to figure out what I want, and put it all together. Before I started looking at manufacturing companies for my frame, there were a few things that I knew I wanted. First, I decided the finished bike would be a piece of art. So when it came down to form over function, form would win most of the time. Of course good looks is subjective. For me, I’ve loved airplanes all my life. 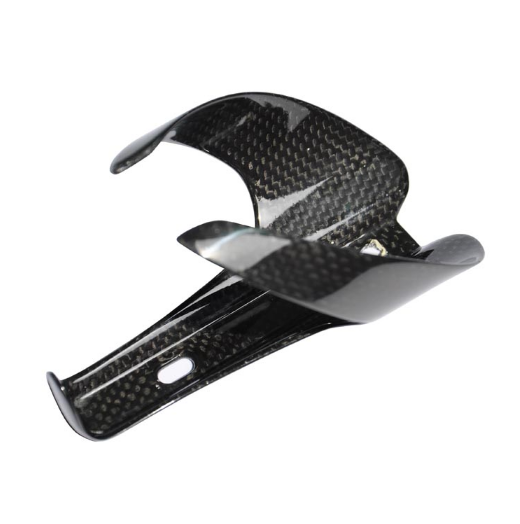 So anything shaped like a wing and made of carbon fiber is at the top of my list. Then there is the cable issue, so internal cable routing is a must. Finally, since I spend most of my time climbing, it needs to be light. I’m going to shoot for a race equipped weight of 7.0 kg. I spent the most time researching frames. There are a lot of ways to buy an open mold frame. 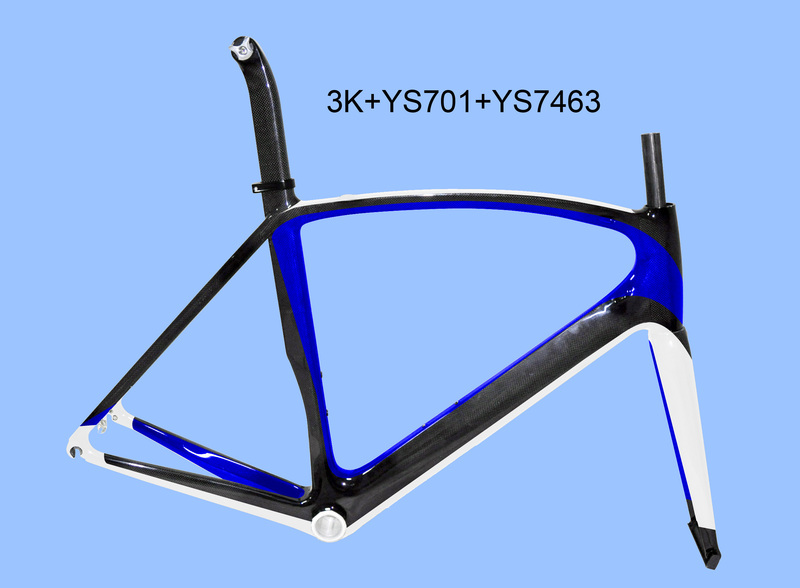 If making a $500 PayPal payment to a company in China sounds crazy to you, then I would recommend searching eBay for “carbon road bike frame” and work through them. You are still ordering from China, but the transaction has the safety of going through eBay channels. A similar option is purchasing through alibaba.com. This is the Chinese version of Amazon, so you may get better pricing due to them being local to the seller and also have the transaction going through a trusted 3rd party. Finally, you can buy direct from the Chinese manufacturers. There are many out there, DengFu, HongFu, VeloBuild, and others. All I can say is if you go this route, do your research. Read everything you can about the frame you want and the manufacturer before buying. YouTube is a great place to start. Make sure you understand their return, warranty, and shipping policies. If I wanted the lightest climber I could build, I would get a pure tubular frame at around 700g. But this is one of those places where form wins over function. I want a frame with “aero” shaped tubes. I don’t want to go full TT as that would leave almost nothing in the way of function on anything other than flats. So that puts the frame I want in the aero-road category. After looking at several dozen frames I decide on the DengFu FM098, which I will order direct. At around 1100g it’s not super light, but it has elegant curves, and I have read several blogs of people getting builds in the 6.8 kg range. Here is a picture off of their web site. Matte finishes are all the rage as they look really stealthy and NASCARish, but I’m a bit old-school. If you have ever sat in a high-end Audi or BMW with a deep glossy carbon fiber dash, that is what drew me to a glossy finish. Again – to each his own. I didn’t just want a solid black frame. DengFu offers any custom paint scheme that you can design for a reasonable price. I’m not very creative, so I looked on their web site for examples and decided one of their standard paint schemes. I will be adding some white custom decals as well. For the bottom bracket, I’ll use BB30. This is the same configuration as my Cannondale, which if this whole thing goes south, allows me to upgrade that with the new components I will be purchasing. By buying this particular frame, the fork, seat post, clamp, and derailleur hanger are included. The headset is extra, but they will include one for $14. The wheels were the second major decision I had to make. As with the frame, there are many Chinese carbon wheel sets available for $300-$500. First, I had to decide on rim depth. This required me to make a compromise between weight, form, aerodynamics, and control. I have found that on my aggressive Cannondale frame, even my 20mm alloy rims are a handful in strong crosswinds, so I didn’t want to get anything deeper than 50mm. An aero-road bike looks best with deeper rims, which pushes me toward 50’s, but I am also worried about weight. So with all of those factors, I am going with 38mm rims. The lightest rims available are from Farsports. Their 20.5mm wide rims weigh in at 1250 grams, which is around 200g lighter than most wheel sets in that category. My biggest concern with these wheels was the fact that they are clinchers. Carbon has a notoriously low coefficient of heat transfer. That means that when you brake hard, the heat builds up on the rim and does not dissipate quickly like it does with alloy. That buildup of heat moves from the braking surface into the tires. When carbon clinchers first came out, there were reports of tires blowing during steep descents with heavy braking. The good news is that new carbons and resins have come out that solve this issue. 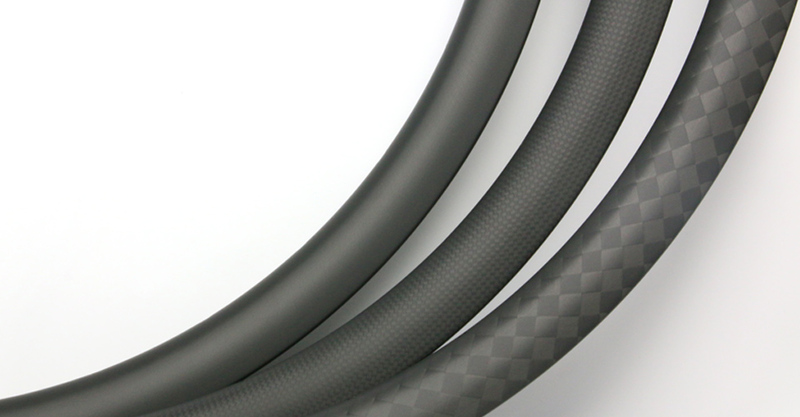 If you are looking at carbon clinchers, make sure they have a basalt braking surface. Given that these wheels do, and I weigh in at 64 kg, I am confident that these wheels will look great and operate just as well in the hills. They will have a 3K glossy finish to match the frame and wheels. They don’t cost very much and weigh about the same as an alloy set, so if they don’t work out, I consider them disposable and can switch them out for something proven. Likewise with the saddle and bottle cages. 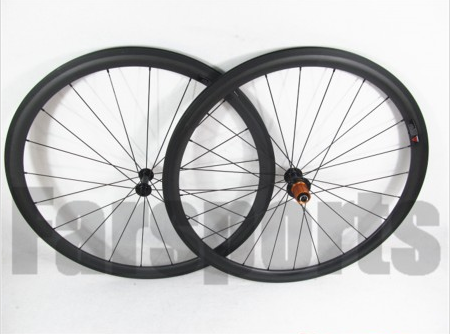 These are cheep and light, but round out the carbon set that I will purchase all from DengFu – excluding the wheels. 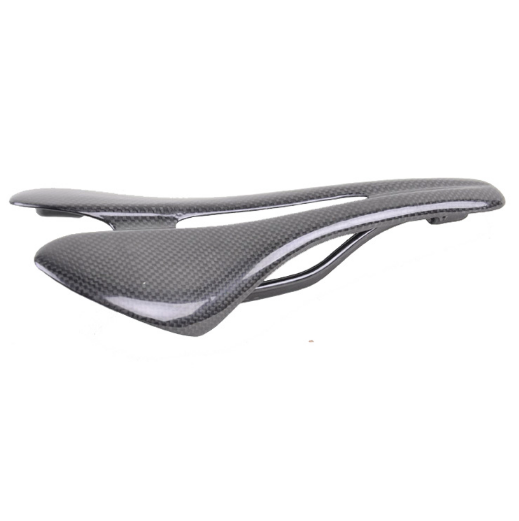 If you are clinching your teeth looking at that pure carbon saddle, remember, the padding is in your shorts, not on the seat. Here is the design of the bottle cages. Both the seat and cages are impossibly light, so I will start with these and see where it leads. When you look at the weight weenies sites, most of the builds talk about a bike that weighs X kg for under $Y. Let me say up front that this is not that. This is about everything that I want in a bike for under 7 kg – that’s it. Well, 7 kg and well under $10K. But when it comes to components, there was only one way to go for me. As I ride my Cannondale hating the cables strung all over the place, I realized, instead of hiding the cables, let’s get rid of them altogether – eTap. 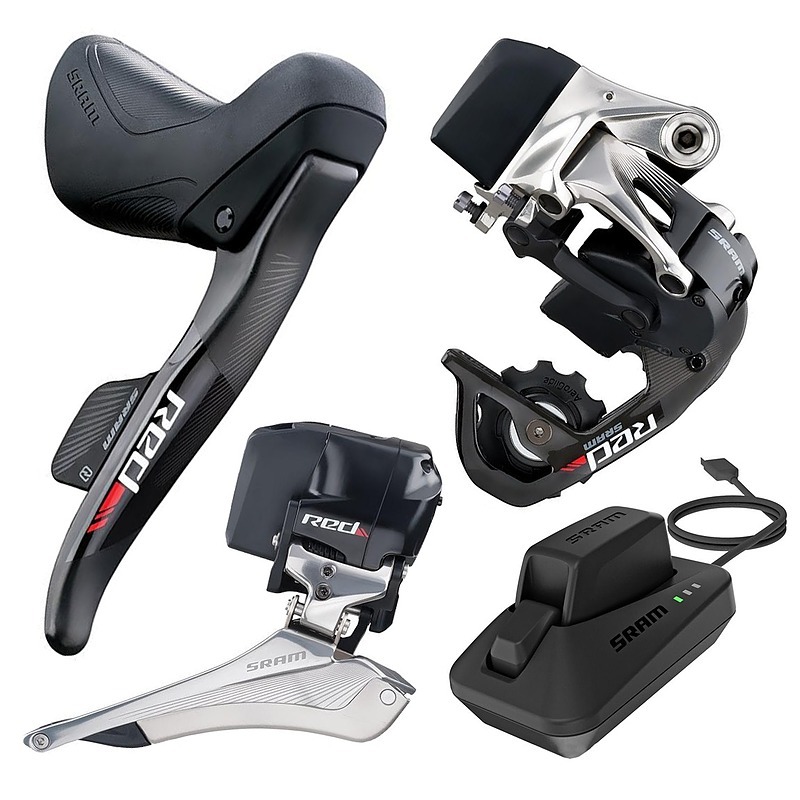 When the SRAM eTap groupset came out, I knew that was the groupset I would put on my next bike. I’m a gadget freak, so show me wireless shifting with formula one style, and I’m all in. At this point, the bike is getting heavier, so a SRAM Red 11 drive train and brakes will keep it light. Finally the best upgrade I have purchased for my Cannondale is a power meter. Training has taken on a whole new meaning when you add kilowatts to the equation. So throw the latest Quarq DZero onto the cranks and we have ourselves one amazing bike. Looks like I am in the ballpark. Time to start ordering parts.